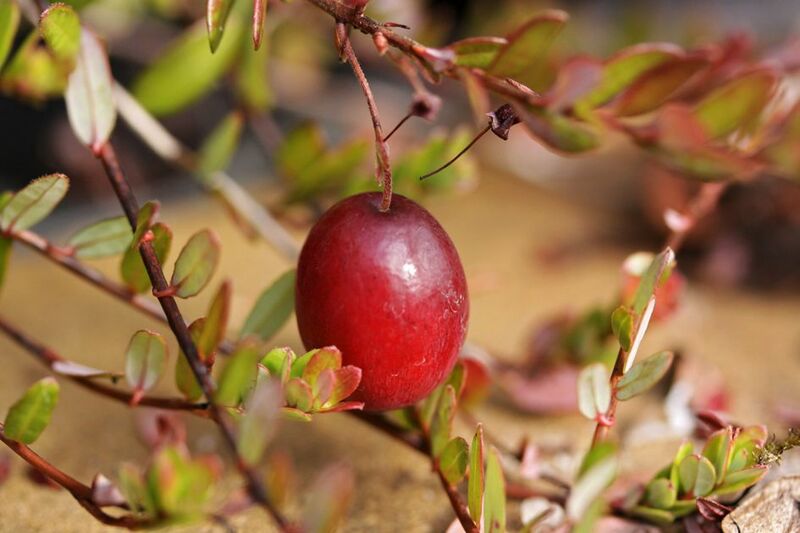 Vaccinium macrocarpon is an herb-like, trailing, evergreen shrub; roots associated with highly specialized ascomycota ericoid mycorrhizae, (Allen1991); stems very slender, elongate, intricately branching, forming mats, flowering branches ascending. Leaves alternate, leathery, elliptic to 1.5 cm long 0.8 cm wide, tip blunt, whitish below, stalkless, often reddish during winter. Vaccinium macrocarpon (cranberry) flowers.Zihao Wang.6.19.2016.NJ (Accessed 3/2017). 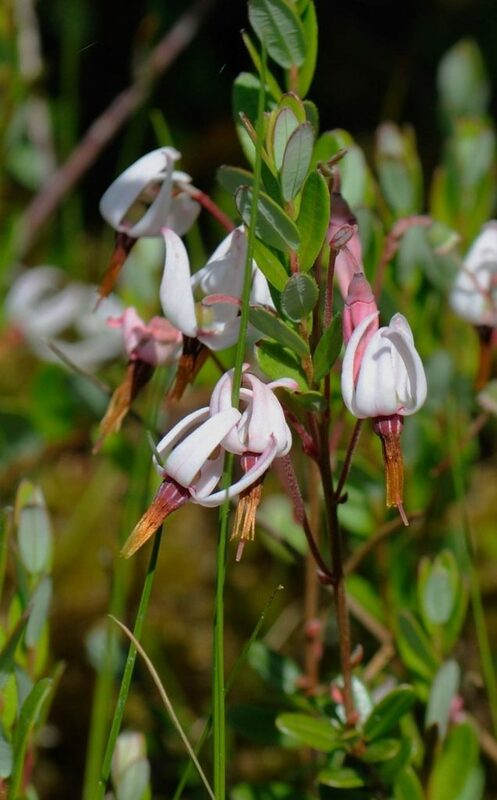 Flowers white (pink), 1 cm wide, petals deeply 4-lobed, curled back,; blooms June-Aug.
Fruit red, firm-fleshy, to 2 cm wide, many small seeds, Sept-Nov. persisting through winter; fruit eaten and seeds dispersed by some birds, probably also by mammals (Martin et al. 1951). Frequency in NYC: Very infrequent. Probably only occurs at one site in NYC. Vaccinium macrocarpon fruit.Alfred Osterloh.9/2010. photo file PDB_86KBg.Creative Commons Attribution-Noncommercial-Share Alike 3.0 License.commons.hortipedia.com (Accessed 3/2017). 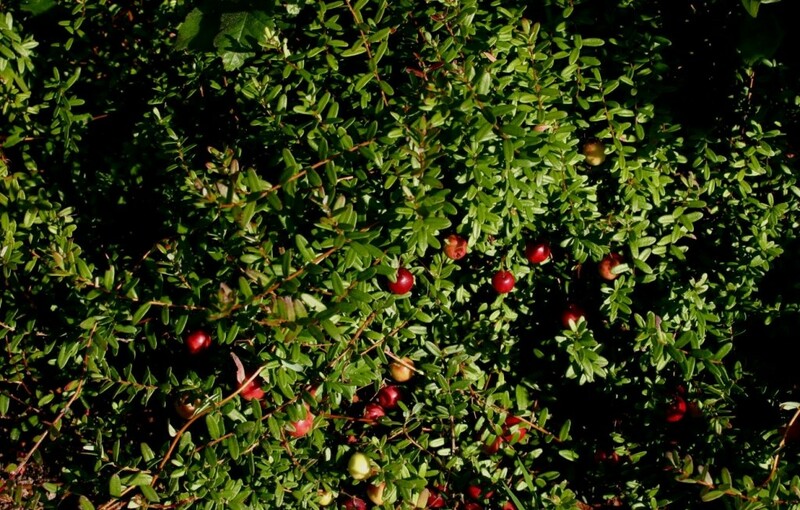 Notes: Widely cultivated for fruit in large boggy plantations. NJ Pine Barrens, MA, and other northern states.